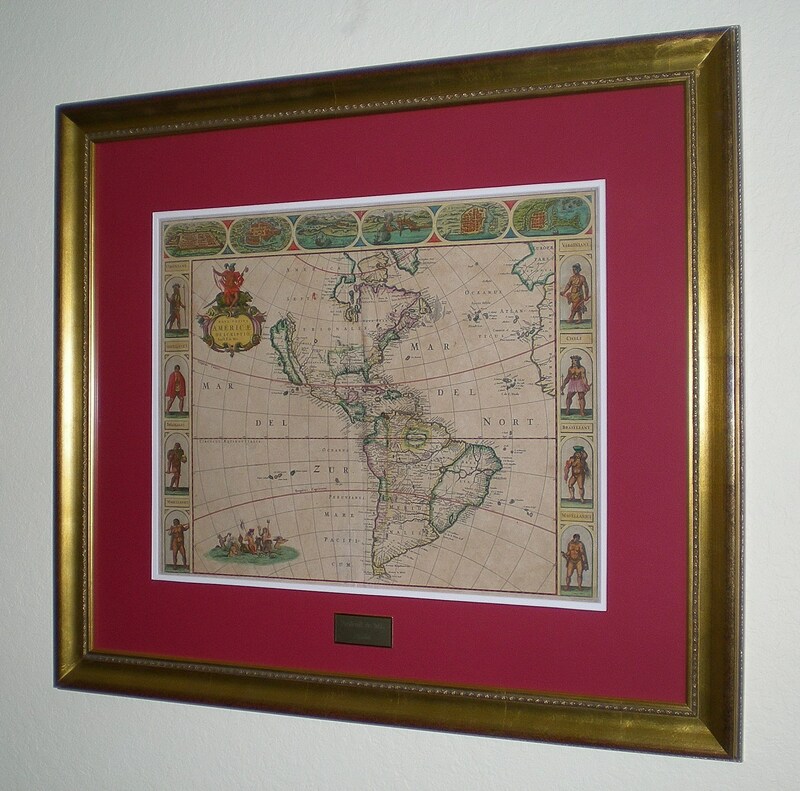 MAP MAKER: Frederik de Wit. SIZE: 21 3/4" X 17 5/16"
Frederik de Wit (1629 -1706 ). 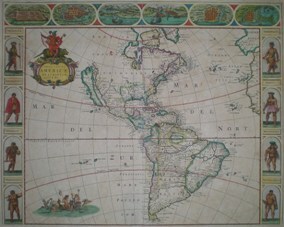 In 1671 he issued his large folio "Atlas Maior". Four years after de Wit's demise, his plates were auctioned to the famous printing company "Covens & Mortier". Which resold them to Louis Renard (who published them under his name). Renard later resold them to the Ottens Brothers (map publishers till the mid XIIIth century). This large uncommon "carte à figures" (21 3/4" X 17 5/16" ) was definitely derived from quite a few works by other mapmakers. The vignettes are directly copied from the 1614 America map by Pieter van den Keere. The "California island" delineation is inspired by his contemporary British peers. It was printed on very strong paper to be sold as an separate item. 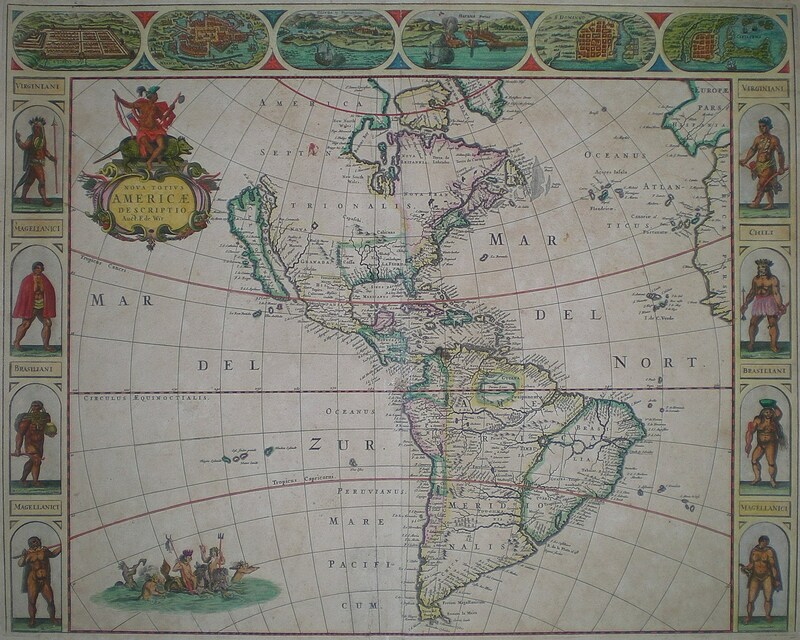 However some examples (like the present item which was folded after being hand colored) found their way into Atlasses (such as the 1659 "Zee Atlas" by Hendrick Doncker). The date of its printing is not known, but is generally given as 1666. The small New England (encompassing only nowadays Maine, Vermont and New Hampshire). The large New Nederland (comprising Massassuchets, Connecticut, New York, New Jersey, Maryland). Only Lake Erie shwn of all the Great Lakes. The confused hydrogrphy of the Amazon bassin. The large decorative allegory of America riding a Merhorse, escorted by Neptune (holding a trident and and a conch) and a retinue of frolicking Tritons.